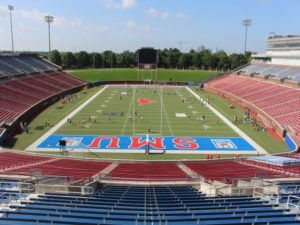 Fort Worth, Texas — SMU has selected Paragon Sports Constructors to replace the synthetic turf playing field at Ford Stadium and work will begin immediately with the new surface being ready for the 2016 football season. The existing field at Ford Stadium will be removed and replaced with PowerBlade Bolt by Shaw Sports Turf. Paragon Sports Constructors personnel will begin removing the existing synthetic turf today with project completion scheduled for August 16, 2016. The new synthetic turf field will be PowerBlade Bolt as manufactured by Shaw Sports Turf, a division of Shaw Industries, a Berkshire Hathaway Company. The design for the new field will remain the same, featuring the Mustang logo at mid-field with ‘SMU’ and ‘Mustangs’ in opposing end-zones. Paragon Sports Constructors is a turn-key contractor of natural and synthetic turf sports fields and running tracks based in Fort Worth, Texas. With over 30 years of sports construction experience they are one of the premier sports field and running track contractors in the South Central United States. Paragon Sports Constructors is a member of the American Sports Builders Association who remains focused on quality construction practices, choosing to partner with top brand name manufacturers of synthetic turf and track surfacing to provide clients a consistently high-quality project from planning to first use. For more information on Paragon Sports Constructors please visit www.paragon-sports.com, follow on Twitter @ParagonSportsCo or find them on Facebook. A wholly-owned subsidiary of Berkshire Hathaway Inc., Shaw Industries is a full flooring provider to the residential and commercial markets. Shaw supplies carpet, hardwood, laminate, resilient, and tile/ stone flooring products, as well as synthetic turf. Shaw Sports Turf is one of the leading synthetic turf companies in North America and has represented quality and innovation for more than two decades with over 2,000 successful installations, including an impressive list of high-profile field installations. For more information please visit http://www.shawsportsturf.com, call 866-703-4004 or find them on Facebook.